Jeremy’s Circle has had another busy year bringing much needed respite to Israeli children whose families have been hit by cancer. It is thanks to your continued financial support, together with the time invested by our many volunteers that we have been able to organize some fantastic day events throughout the year, expand our successful mentor program run in cooperation with Hillel and maintain the play-date database to make introductions for informal get-togethers with “another kid like me”. 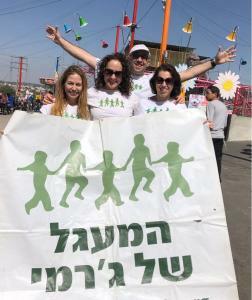 Jeremy’s Circle remains the only organization in Israel dedicated to supporting the children coping with cancer in their families or with a cancer loss. Jeremy’s Circle is especially active during the many holidays from school when parents are under extra pressure and the kids, more than ever, need some respite. We organize large events for kids from around the country on Sukkoth, Chanukah, Passover and over the summer, and smaller events together with the children’s mentors on Tu B’Shvat and Purim. During the Pesach break we visited an ecological educational centre called Adam ve’Hava (Adam and Eve) Farm. In July, we made two trips to the unique ‘Better Place’ visitor’s centre, arranged by a Jeremy’s Circle dad Ehud Seker (thanks Ehud!). Better Place, is trying to create a global network of electric vehicles and services. In August, we had 3 separate fun days: one in a wonderful Moshav in central Israel where the kids saw a variety of animals and took part in farm-based activities including crafts and cheese making; a visit to the North to visit the Strauss Dairy Factory which included a 3D movie, a tour, a make-your-own yogurt game and lots of tastings! (Thanks to Strauss for the free admission! ); and a visit to the Osem Bamba factory and a picnic and playtime in a nearby park. 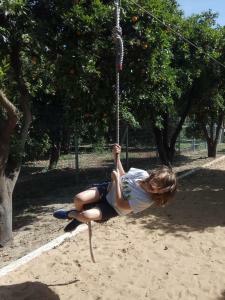 During Sukkoth we enjoyed a fun-day including a show and pizza at a Bird Safari. During Chanukah we went to the Diaspora Museum where we toured age-appropriate exhibits, played games and even had a drumming workshop. The day was wrapped up with candle lighting and presents for the kids. Thank you to the Friends of the Diaspora Museum for covering the entrance fees and to the museum’s management and staff for the educational but fun activities. Well over 150 children benefited from our activities this year. We kicked off our new effort to supporting teens with our first teen overnight hike. Twenty Jeremy’s Circle teens from across the country got to know each other while touring the hills of the Gilboa region. In the evening the kids bonded over a campfire BBQ meal followed by a late night movie and games. Early next morning, after an excellent breakfast, the group set off and walked along the River Snir, enjoying the scenery and fresh cold water of the nearby springs. The tired but happy kids raved about the trip. The reciprocal support provided by each family is rapidly creating a unique community. Sadly 2010 marked the passing of a number of Jeremy’s Circle moms and dads…some of whom we met at our very first event two Chanukas ago. Natan Bergman, a Jeremy’s Circle widowed dad and child psychologist has donated his time to help some of the newly widowed parents, suggesting tools and offering advice in support of their grieving kids. In parallel and throughout the year we have been running our mentorship program in cooperation with Hillel. The program matches undergraduates with Jeremy’s Circle kids and provides a much-needed outlet and additional support for the children and parents. The program is going strong in Tel Aviv and Afula, and this year we are starting a monthly teen group in Haifa, led by Hillel mentors. In parallel, this year we started a mentor program with a high school in Modi’in, with five students spending an afternoon a week with young Jeremy’s Circle kids. We’d like to sincerely thank all of those that have contributed, both financially and with their continued support and encouragement. We hope that in 2011 Jeremy’s Circle will continue to bring comfort and support to the many young families who have been hit by cancer. We will continue the good work we are doing while expanding our programs for teens. We also plan to offer more programming to our newly widowed parents, to help them best help their kids. Of course, such programs require funding to succeed and this will be a key fundraising priority for the year ahead. Tax deductible donations can be made by check or online through the Good People Fund (www.goodpeoplefund.org). Please specify that the contribution is for Jeremy’s Circle. Pesach 2011 - 15 April - save the date!